David grew up in the Barrio Logan community of San Diego, the neighborhood on the working waterfront that has a long history of environmental degradation, high asthma rates, and industrial-residential conflicts. His childhood home was next door to a chrome plating plant, and he can trace his own asthma to the constant presence of toxic emissions affecting residential areas, school playgrounds, and parks. That experience sharpened his resolve to fight for social, economic and environmental justice. Elected to the San Diego City Council in 2010, David is currently Chair of the Environment Committee, and a member of the Smart Growth & Land Use Committee. Additionally, he serves on the San Diego Metropolitan Transit System Board, SANDAG Borders Committee, Otay Valley Regional Park Policy Committee, and Bayshore Bikeway Working Group. He also is a member of the Board of Director’s for Local Progress, the League of California Cities Latino Caucus, National Association of Latino Elected and Appointed Officials (link is external)(NALEO), a board member of the newly formed San Diego Coffee Training Institute and serves on the Advisory Board for The Science Exchange. David has been successful in restoring vital city services in each year of the City’s budget, including funding increases for libraries, police and fire protection, more street repair and installation of street lights and reducing retiree health care costs. David’s achievements includes the creation of Cesar Solis Park, the first park built in decades in the South Bay, development of a new library for San Ysidro, a long awaited safe pathway for San Ysidro students, and has spearheaded the revitalization of Barrio Logan, including the formation of the Barrio Logan Planning Group. 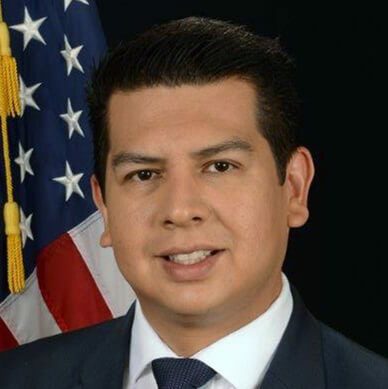 He has been a regional leader in advocating for more park space in the South Bay, increasing and safeguarding San Diego’s water supply, border infrastructure and decreasing border wait times to increase trade and commerce, and creating more opportunities for local small businesses. David was born in San Diego to Jose and Maria Alvarez and has four brothers and one sister. Growing up in Barrio Logan, he attended local public schools: Perkins Elementary, Memorial Junior High, and San Diego High School. David was the first in his family to graduate from high school and college. He graduated with honors from San Diego State University. David lives with his wife Xochitl, their daughter Izel and son Javier Andres in Logan Heights. He is an avid cyclist and bikes to work often. David is proud to continue the work he began in childhood and strive to carry out every day: to bring social, economic, and environmental justice to the people he serves.